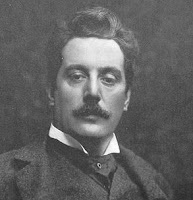 Tosca, by Giacomo Puccini, premiered on Jan. 14th, 1900. A work more than 3 years in the making, it is now one of the world's most popular operas. The plot is basically an adaptation to a play produced by Victorein Sardu in 1887 and seen by Puccini in Milan. Like most opera's it is full of love, loss, murder and suicide. Floria Tosca is a singer who is in love with Mario Cavaradossi, a painter. Cavaradossi helps an escaped political enemy by the name of Angelotti hide. Unfortunately the chief of police, named Scarpia, who by the way is in love with Tosca, discovers the offense. Capturing Cavaradossi, Scarpia tortures him, taunting Tosca until she reveals Angelotti's hiding place. Carvadossi denounces Tosca for giving in, and is taken off to prison. Scarpia attempts to force himself on Tosca and Angelotti is discovered dead, having committed suicide before being captured. In the despair of her lover's denouncement, his likely execution, and in the midst of thwarting Scarpia's aggressive tactics, Tosca sings the haunting prayer in the aria, "Vissi d'arte, vissi d'amore"
Lyrics: I lived for art, I lived for love/ I never did harm to a living soul!/ With a secret hand I relieved as many misfortunes as I knew of./ Always with true faith my prayer/ rose to the holy shrines./ Always with true faith/ I gave flowers to the altar./ In the hour of grief why, why o Lord?/Why do you reward me thus?/ I gave jewels for the Madonna's mantle/ and I gave my song to the stars, to heaven, which smiled with more beauty./ In the hour of grief why, why, o Lord, ah, why do you reward me thus? Although Tosca herself is not dying, she is singing in the realization that she will soon lose her lover, and I see contemporary palliative care themes in this prayer. This type of plea could easily be whispered by family members at the bedside of one dying or by the patient them self. First there is the accounting of worth. We reflect on our character and persona. For Tosca her list includes a passion for love and art, a humble generosity (secret hand relieving misfortunes), and a respect for others (no harm). Second is an evaluation in accordance to our faith traditions. Tosca lists her offerings of flowers and prayers in the shrines and alters, and jewels for Madonna. Finally is the assessment of career and external works. Tosca was a singer, so she reflects that she sung and the world was more beautiful from her contribution. Aren't these classic elements of reflection? Who we are internally, externally and if appropriate, who we are in accordance to our faith tradition? The purpose to Tosca's reflection, however, is really a question. What strikes most listeners, endearing this aria to audiences, is the timeless question, "why?". Why do bad things happen to good people? Listening to this aria with the 'why?' in mind, you will hear the despair and the grief in Tosca's words. Perhaps this song can help us to explore with others those deeper areas for reflection. Below is the Youtube video of Maria Callas singing with lyrics included.